Shield bugs or True Bugs (Heteroptera) have fascinated me since I started to study biology many years ago. I have spend years studying bugs and particular water bugs but not many know these small interesting bugs. Despite their secret life to many they are in fact often very colorful, beautiful and contrary to most beliefs mainly harmless and live of plant dew which is sucked out with their long proboscis. This image show one very common True Bug — Coreus marginatus also commonly called the dock bug in Europe. The photo of Coreus marginatus was captured with the Canon 5D Mark II together with the Canon 180mm f/3.5 macro lens positioned solid on a tripod while the bug were resting on a leaf. 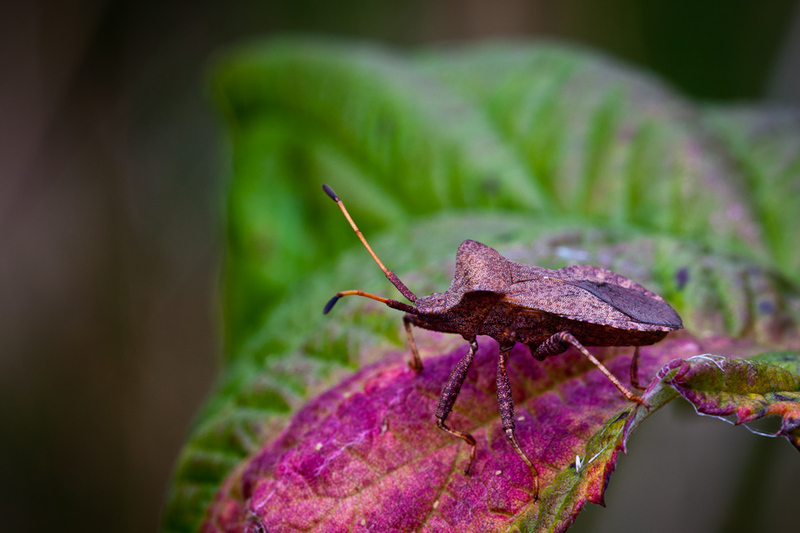 Being at the end of the season in late September the green to purple colors of the leafs and the brown colors of the bug goes very well together and rendering a very colorful image of this brown shield bug.